Stephen Hawking is my hero. He embodies all the noble qualities the modern scientist puts forward into the world. He is the man who pushes through all his personal hardship and fights on even though he is crippled by terrible disease; all in order to forward humanity’s quest for knowledge. His awe inspiring dedication to understanding how the Universe works speaks volumes of the great things we can achieve. In our daily lives, we often find ourselves in situations where our plans fail and our dreams seem too far away to conquer. In situations like this, I find myself thinking of all the scientists and great inventors that could not reach a conclusive result in their research for years and years but still pressed on, gripped by the certainty that after all their hard work, they will ultimately fulfil their goal of pushing the boundaries of human understanding. But of all the notable men and women who sacrificed themselves for science, the person I think most about is Stephen Hawking. Not only has he found incredible ways of dealing with his illness in order to keep working, but he was never afraid to go back on his own theorems and disprove them. For example, while initially stating that black holes cannot get smaller, he lately reached the conclusion that black holes emit radiation – known today as Hawking radiation – and thus decrease in size. I think that the fact that he was willing to disprove his earlier theory speaks of the selflessness with which he pursues his work and he should be an example to us all. 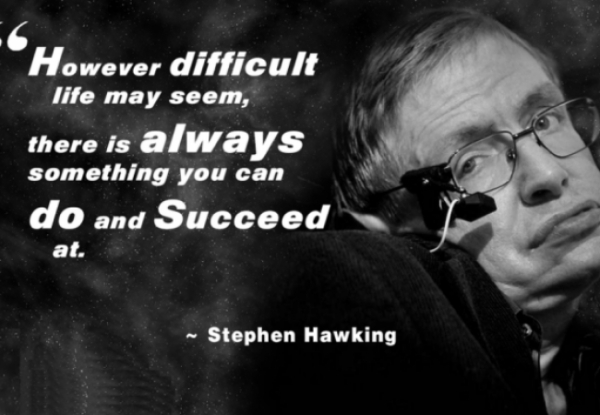 Thank you Stephen Hawking for your priceless contributions to humanity, in both mind and spirit!